These days, it’s not necessary to be in front of the TV to get updates on sporting events – or even to watch matches. Why even bother when updates and live streaming is available on the go through our smartphones? Accessing sports, TV shows and movies have never been easier. Australian telcos have increasingly been investing in the rights to stream content, and many offer data-free streaming for the sports they cover. Telstra, Optus and OVO are the top three mobile providers in Australia that have dominated the area of sports coverage. Here’s a comparative review of their offerings so you can decide the best option for your sporting preferences. When it comes to accessing sports content on your phone, the data costs can quickly chew through your data allowance. Streaming a 3-hours sports game on your smartphone can use up to 900MB data from your monthly plan. The data costs might make you reconsider watching sports on TV. But different operators offer cost-effective options to facilitate sports streaming on mobile devices. Heard of Opus’s investment in broadcasting rights to the EPL, Champions League and the FIFA World Cup? Telstra has also made a similar investment in the NBL, AFL and ARL, while OVO has invested in sports coverage for niche sports such as gymnastics, world super bikes and drag racing. Each operator provides different sports coverage, so it’s an important to factor in your sports preferences when choosing a mobile provider to save on data costs or paid subscriptions for live streaming. Telstra has partnered with NRL, AFL, AFLW and Netball to provide its customers coverage of their favourite sports. The telco has launched dedicated apps that allow you to stream games live, fast and data free. 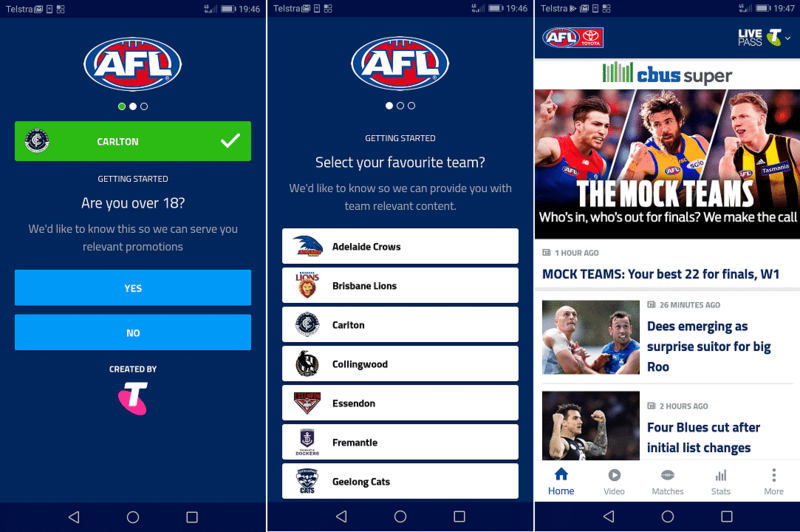 All the Telstra post-paid and pre-paid mobile customers (although prepaid customers must maintain at least $30 in active recharges) can download the AFL/NRL/Netball Official Apps and get the Live Pass to stream sports. The AFL Live app offers the latest news, match highlights and scores from the AFL season. Fans can get a targeted news feed for their team affiliation. The app also offers AFL stats and additional details on teams and individual players. With the AFL Live pass subscription, every game is available through a live stream, year around. The Live Pass is available for a weekly subscription of $4.99, a monthly subscription of $19.99, and yearly subscription of $99.99. Telstra mobile customers get the best deal with a free live pass for this season bundled into post-paid, pre-paid and mobile broadband plans. The NRL live app is your ticket to all rugby games. The app offers live scores, video highlights, bunker decisions and player stats. The NRL Live Pass live streams every Premiership game, and costs $99.99 yearly. However, you won’t need to pay a cent if you are a Telstra customer, as the telco is offering a free live subscription for the 2018 season to all the pre-paid, post-paid and mobile broadband customers. All Australian Netball content is packed into the Netball live subscription streaming service. The service allows you to enjoy every Australian Diamonds and Suncorp Super Netball game played in Australia. The Netball Live app also delivers the latest news updates from your favourite team, comprehensive stats and full match replays. You can subscribe to a Netball Live Pass for $29.99 per year. All the Telstra sports coverage apps are available on both iOS and Android devices with a screen limit of 7 inches. Optus holds cricket and EPL streaming rights, providing live and on-demand streams, dedicated 24/7 news, interviews and insights. The telco began covering England’s premier domestic division at the start of the 2016-17 campaign and will be exclusively showing the league until at least the end of the 2021-2022 season. Beyond the EPL season, Optus Sport also offers an assortment of other international competitions. The Confederations Cup and the AFF Suzuki Cup are available on the Optus Sports app as well, and they have recently acquired the rights to stream most of the Champions League matches. Optus Sports allows viewers to watch live games on the app, and also provides an option for viewing on the big screen. Optus offers dedicated apps for Amazon Fire TV, Chromecast, and any generation of Apple TV to airplay from the mobile app. You can purchase your Optus Sports subscription through the app, or bundle it with your post-paid or fixed broadband plan at no extra cost. After activating your subscription, you can log in and use with your preferred streaming option. Eligible Optus customers can add Premium access to their plan at no extra cost, while the non-eligible customers and non-Optus customers can get a monthly subscription via Google Play or the App store at just $14.99/month. An upside of Optus Sport is that it allows you to view sports on most modern and Internet-capable devices. Computer users can stream using the Optus Sports website. Both Windows and Mac devices equipped with a compatible browser will happily stream your favourite sports. While the Optus sport mobile app is supported on all Android phones and tablets running Android 4.4 or higher, and the iOS devices running on iOS 8.0 or higher. If you prefer to watch EPL on the big screen and have the fourth-generation Apple TV, you can directly download the Optus Sports App. For older models, you can use AirPlay to stream the matches. Similarly, those who have Google Chromecast can connect using their Android devices. OVO is another leading mobile network provider that also offers a broad range of sports streaming options. From Rugby to Motorsports, OVO has partnered with several sporting codes to provide on-demand video, live streaming of matches and a wide range of interactive content. OVO is presently specializing in delivering professional and grass-root sports such as gymnastics, water polo and niche Motorsports. Since these sports aren’t represented in Australia’s mainstream media but still have a wide audience base, OVOPlay’s unique offerings have become increasingly popular. OVO customers can enjoy their preferred sports content via the OVOPlay, which can be accessed both via the website and through mobile devices running on Android or iOS. OVO Play is a web app, so it’s not necessary to download an additional app to stream sports. You can simply launch the web app through the browser on your phone, tablet or PC. As of now, the OVOPlay app features V8 Supercars coverage that offers customisable live in-care telemetry data while racing. Beyond that, OVOPlay also covers Thunder drag racing, Water Polo Australia, Audi Sports Racing Australia, Gymnastics Australia events, World Superbikes, Formula Drift and the Australia Esport League. If you have a data plan with OVO, access to OVOPlay is entirely free. Plus, all the sports streaming is unmetered and won’t affect your monthly data allowance. There’s no viewing limit, and you also get 50-minutes highlights for all the sports event available 48 hours after the game has closed. With the soaring demand for easy access to live sports content on the go, Australian mobile providers are investing heavily to attract customers. Sports streaming in Australia is being hotly contested, with Telstra offering faster streaming for AFL Live app subscribers and Optus continuing to bolster its soccer offerings, despite the World Cup debacle. However, it’s not all smooth sailing – the Optus network has been under fire after the streaming issues during the World Cup matches, and Telstra’s downside is the limited screen size, which is a turn-off for sports fanatics who prefer big screen. Here, OVO has excelled with its promising offerings and quality service. The telco has been competing incredibly well against the fierce competition. The market has seen sports streaming primarily being reserved for the big telcos, but OVO’s offering of unlimited data for sports and a distinguished choice of partners has made them extremely competitive. Sports fans now have the choice to opt for a data plan with a mobile operator that offers their preferred sports coverage, or simply purchase a subscription to stream matches from their favourite sports. As long as the telcos uphold the high quality streaming expected by fans and continue to provide good service, the competition between telcos promises an exciting future for Australian sports streaming.